The "Traditional" insulated single hung window is designed to be a cost effective, low maintenance, high performance utility single hung window. They are manufactured with high quality polyvinyl chloride (PVC) materials, with the frame and sash corners being fusion welded for strength and weather tightness. The lower sash is double weather-stripped for weather tightness. 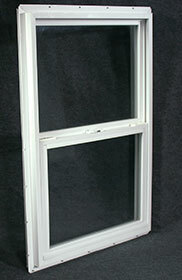 The window has an operable lower sash which allows for superior air flow while the top lite is glazed directly into the frame for added strength. The operable sash includes tilt latches on the meeting rail which allows the sash to tilt inward for easy cleaning and removal, and features a spring balance system to assist in operation of the sash. The meeting rail has a full interlock design with a hook latch lock for security and strength. NVSH1836WI 18” x 24” 17-1/2" x 35-1/2"
NVSH2436WI 24" x 36" 23-1/2" x 35-1/2"
NVSH2442WI 24" x 42" 23-1/2" x 41-1/2"
NVSH2448WI 24" x 48" 23-1/2" x 47-1/2"
NVSH3030WI 30" x 30" 29-1/2" x 29-1/2"
NVSH3036WI 30" x 36" 29-1/2" x 35-1/2"
NVSH3042WI 30” x 42” 29-1/2" x 41-1/2"
NVSH3048WI 30" x 48" 29-1/2" x 47-1/2"
NVSH3054WI 30” x 54” 29-1/2" x 53-1/2"
NVSH3648WI 36” x 48” 35-1/2" x 47-1/2"